The problem of moving people around efficiently is a bit of a ticking time bomb, as the global population grows and concentrates in already overcrowded urban centres. Add to this the fact that we’re all getting older and living longer, and the urgent need to cut down carbon emissions, and we’ve got a serious challenge on our hands. Technology will no doubt play a huge role in addressing that problem, but many of the people working on that at the moment are not doing so from Silicon Valley, but in Holland. It shouldn’t surprise anybody to learn that the Netherlands has the highest bicycle use rates in the world. Much less known, however, is the fact that they have a long and proud history of pioneering automated driving technology going back to 1995, or that its electric bus manufacturers are thriving due to the government’s directive that require all public transport vehicles sold in the country to be zero-emission by 2025. I learned all this while touring Holland last month as a guest of the Netherlands Foreign Investment Agency, who were keen to show off their innovation in the area of automotive technology and mobility. As is always the case with such trips, you take everything you’re told with a grain of salt, but at the end of a rather gruelling 3-day trip (the Dutch don’t believe in over-pampering journalists and even my jet-lagged American colleagues were held to 7:30am starts) I was left rather impressed. It wasn’t any one particular company or technology that stood out, however, but the way that everyone I met seemed to be so focused on how it all fit together into long-term and sustainable strategies. Much of the focus where it comes to smart mobility tends to be on the “sexier” tech of self-driving cars – it is, after all, as one of our hosts put it, “the first large-scale deployment of robotics in a society at large in human history” but that’s only part of the picture. Because as vehicles become smarter and more automated, there will also be advances in data communication between cars on the road and between cars and roadside installations. 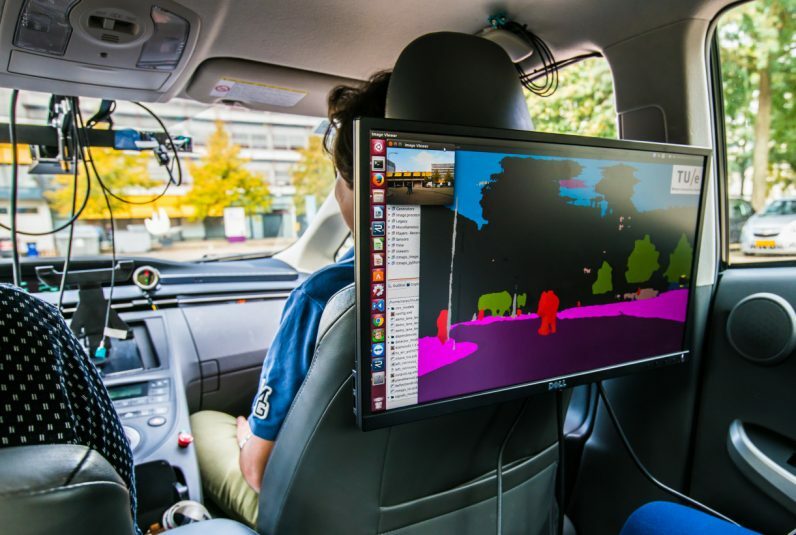 In other words, there is a need to teach those “autonomous” cars to take into account real-time data about their surroundings and other vehicles. Automated driving in real life should take into account the role of data, object detection and social driving. These are all incredibly complex things to try and teach a machine, says Robbert Lohman from a start-up called 2getthere, which works on automated transit applications ranging from Automated People Movers to Shared Autonomous Vehicles. The Netherlands believes that by introducing cooperative Intelligent Transport Systems (ITS) and focusing on infrastructure rather than just vehicles, they will be able to significantly improve traffic flows in terms of safety, efficiency and environmental impact, as well as boosting their competitiveness in terms of job opportunities and economic growth. And when you start looking at whole infrastructure solutions, the economies of scale quickly start adding up in seemingly unlikely places. Take Heavy Goods Vehicle (HGV) Platooning, for example. This is the practice whereby automated/self-driving technology can be applied so that several trucks can follow one another along a road. By keeping a steady speed and very short distance from one another, they reduce factors such as wind resistance, and manage to significantly reduce fuel consumption as well as dramatically improve safety. “I expect that our children will live in a world where humans are not allowed to drive. 1.2 million deaths are caused by traffic accidents every year. 95% of those are due to human error,” said Professor Maarten Steinbuch at TU Eindhoven University during a demonstration at the Automotive Engineering Science (AES) Laboratory. At the Research Automated Driving Delft RADD – a facility enabled by cooperation between governments, knowledge institutions, and small and mid-size business entrepreneurs – I saw what that future might look like in practice. The WEpod has been operational since early 2016 is one of the first real-life projects on automated driving in the Netherlands, the first of its kind to be allowed to operate on public roads among normal traffic. The next phase of the project will now cross the border towards Germany, explains Project Leader Jan Willem van der Wiel. One key strategic advantage the Netherlands has is that it is small enough so that looking at holistically implementing innovations over the entire country’s infrastructure is a much more practical proposition than in countries like the US, where you’re dealing with much broader territories and regulatory variations. This, together with the fact that Dutch infrastructure is among the best in Europe (the entire country has 4G coverage) makes it an ideal test bed for piloting ambitious mobility tech. A sort of controlled “living lab” microcosm that allows for reliable real-world data capture. According to Edwin Nas from the Netherlands Ministry of Infrastructure and The Environment, the belief is that the Dutch “learning by doing” approach gives them an edge, allowing for iteration and adjustment of systems as well as adapting to legislation as the landscape evolves. There is also, he adds, a culture of collaboration both within Holland and at a European and Global level. A coordinated approach at a European level and closer cooperation between governments and stakeholders is needed for these innovative systems to reach market, he concludes. The Research pipeline is closely integrated into the broader strategic vision too, with many independent and industry-backed R&D hubs such as the Holst Centre developing wireless sensor technologies, and an impressive crop of students achieving remarkable success in international competitions that push experimental and bleeding-edge technologies. Zuyd University’s Project Fuze, for example, are engineering a 3D-printed race car for Formula Student races in order to demonstrate how it is possible to build lighter and sustainable vehicles without compromising safety, while the Delft Hyperloop team won Elon Musk’s global competition to develop a prototype for an ultra high-speed train system that will in theory allow travellers to go from London to Edinburgh in under 30 minutes. Now the Hardt Hyperloop is working with some of Holland’s largest corporations to develop what they hope will be the world’s first commercial Hyperloop route. Sustainability is also a big part of that overall equation, and various companies are working on the problem of lowering emissions from different angles. Solliance is developing next-generation solar cells, for example, and Eurocarbon produces composite materials from fibres such as glass, aramid carbon and thermoplastics which are up to 50% lighter than steel, and provide up to 40% saving in energy consumption, again without compromising on strength and safety. This agenda of connecting expertise to improve mobility in a sustainable and socially responsible way is supported by several organisations at a national and local level. Connekt is an independent network which brings together members from across the private sector, academia, public interest groups and government to promote smart, sustainable and social mobility, while the last stop on our tour – Amsterdam Smart City connects communities to share expertise and kick-start projects that futureproof the country’s capital. And it’s in Amsterdam that some of the most interesting experiments in integrating different solutions into a holistic framework are being rolled out. The idea of Mobility as a Service (MaaS) involves using a unified software platform to manage resources so that individual and collective transport needs are met seamlessly, and with little or no waste of resources. Companies like Next Urban Mobility want to create hubs which integrate use of cars, bikes, public transport and delivery services in intelligent and data-driven ways. Their ambition is to be a sort of “Netflix for transportation” providing on-demand services as and when users want it. The reasoning behind this is that – just as most of us would now rather stream content rather than having hundreds of DVD and Blu-rays gathering dust on our shelves – the next generation will probably wonder how anybody could ever justify having a car that’s only used every two weeks or so, as is the case with the average Amsterdam car owner. As I flew back to the UK – glumly pondering on Brexit as I went past the “EU passport holders” sign at the airport – I couldn’t decide whether the picture Holland was painting was achievable, or an over-ambitious dream. Wasn’t this a case of – to again borrow a popular Brexit analogy – “having your cake and eating it?” Pulling off such a nationwide smart mobility plan would, according to most people I spoke to, eventually deliver an infrastructure where all their citizen’s transportation needs would be met much more quickly, cheaply and safely – all the while advancing science and technology, protecting the environment and contributing to boosting the domestic, regional and global economy. But I suppose for a country with such a disproportionate share of tall and good-looking people who all seem to be fluent in at least four languages, that might be the natural order of things. Besides, the Dutch personality seems to combine the practical bend of the Germans with a healthy dose of daredevil craziness, which means they’re often game for experimenting with new things. And since leaps of innovation rarely happen without some degree of risk, they might be well onto something.